How is the weather over there? The rainy May we had has started to spill over into the month of gloom, I mean, June over here. I’m sure it will clear up soon, so I can finally work on my Twilight complexion, minus the sparkles. It’s true! My BlackBerry told me so. How do you check the weather on your BlackBerry? 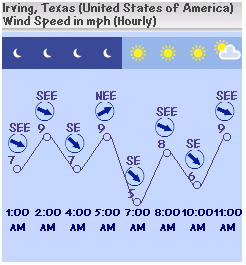 Some users point their mobile browsers over to their trusted weather stations mobile site. Others decide to either slap on sunscreen or throw on a raincoat based on what their friends and family say on Facebook, Twitter, etc. 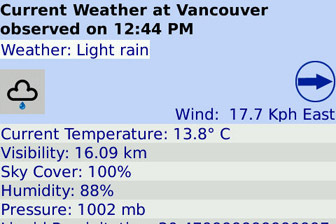 For those who want the latest conditions and forecast information, I say it’s time for a BlackBerry weather application. One of the many mobile mini meteorological marvels to mention (whew!) is Ace Weather Forecasts. Regardless of whether you are wondering about the conditions of where you are, where you’ll be or where you wish you were, Ace Weather Forecasts provides in-depth weather conditions for nearly every location around the globe. There’s a 100% chance of a review after the jump. The application was developed by Ace Mobile Software, who also gave us Ace Mail Viewer and Free Ringtones Maker. For anyone still using an older model of BlackBerry, make sure you are running at least OS 4.2 or higher, in order to use Ace Weather Forecasts. The most recent version of the application is 1.1.203 and has a file size of 223.8 KB. As I mentioned before, Ace Weather Forecasts provides information for “any worldwide location”. When you initially start up the application, you will be asked to enter in the location you wish to receive information about. You are also able to create a list of multiple locations you want to keep your eye on. The homepage icon is transformed into a basic weather notifier. The icon graphic gives a visual representation of the current weather. I did have issues with another feature - My location, current temperature and conditions would appear as text as I scrolled over the homepage icon. I pulled the battery, and when my BlackBerry rebooted, the application was gone. After downloading a second time, I lost the home screen text update for an hour; only the application name appeared. Opening the application you can see additional current weather details that include: wind speed and direction, visibility, humidity pressure, precipitation and sky cover (on top of the temperature). 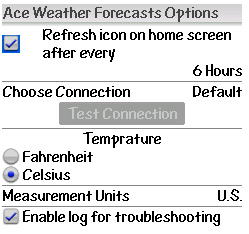 Ace Weather Forecasts also includes daily and hourly charts and forecasts for each of the details, as well as sun/moon rise and set times. Using your trackball/trackpad, you can scroll up and down to move between each detail chart and scroll left and right to navigate within the displayed chart. If they were able to fit all of the information on the screen (instead of 90% of it) it would eliminate in-chart navigation. I was glad to see that the application supports both metric and imperial units of measurement. While Ace Weather Forecasts does a decent job of providing weather details, in my opinion, it needs a fair bit of tweaking, as far as presentation goes. There are other weather apps out there that sport a clean UI, so I have high hopes for this one! It is also fairly expensive, costing $19.95, where similar apps are typically go for half of that. The good news is that there is a free trial period AND it’s on sale in the CrackBerry App Store for $9.75 until June 30th.